We all love to hear stories about heroic humans who – perhaps while on a boating trip, or hanging out at the beach – go that extra mile to help a marine animal in need. Whether these people encounter a blue whale caught in a gillnet, a beached whale in distress, or a turtle trapped by a net, the one thing that is clear in each case is that they have truly proven their compassion and their dedication to helping those less fortunate than themselves. This image illustrates the scenario that may immediately come into many people’s minds when they think of saving sea animals. Rescuing an individual animal from distress is certainly a worthy thing to do – though wherever possible, it should be done with professional support and advice. Consulting one of these 5 Marine Animal Rescue Hotlines would be a good place to start. 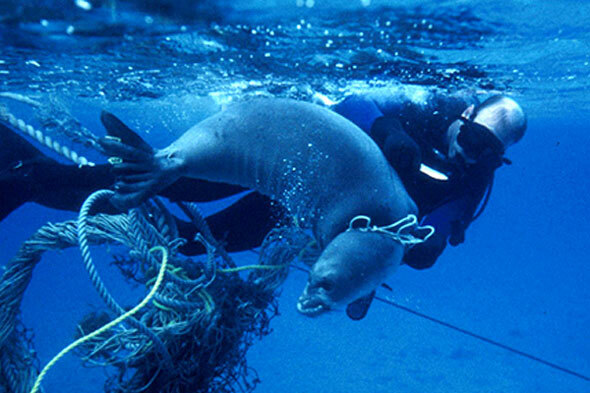 However, the best and most effective thing any of us can do is to ensure that marine animals do not end up entangled by fishing lines or plastic trash in the first place … and this involves taking action in our daily lives. Bycatch – the capture of untargeted marine species by fishing trawlers – is a serious threat to the survival of sharks, dolphins, turtles, and manta rays, to name just a few of the marine animals suffering because of the actions of the fishing industry. These animals often end up caught in fishing nets that were intended to ensnare fish like tuna or cod. Whale and Dolphin Conservation estimates that over 300,000 whales, dolphins and porpoises die every year as a direct result of becoming caught in fishing gear. Eliminating seafood from your diet is a huge step toward helping these species to recover. To learn more, read our article, 5 Marine Animals We Have Put in Grave Danger and How You Can Help Them Now. There are also 270,000 tons of plastic debris floating around on the surface of our oceans alone, but an estimated 8.8 million tons of trash are dumped into them every single year. 700 marine species are threatened with extinction as a result. In fact, a recent report by Project MainStream predicted that there could be more plastic than fish in the oceans by 2050. Another scary prediction that has been made by some conservationists is that our oceans could be devoid of all life by that date! The good news is that there is still time to prevent these worst-case scenarios … but we definitely need to act fast if we want to ensure that our oceans have a chance to recover and thrive. If you need some inspiration why not read the story of these seven amazing people who prove that living plastic-free is possible? You can also find some helpful advice in our posts, 10 Life Hacks to Help You Cut Plastic Out of the Picture, or 5 Simple Go-To Tips to Shrink Your Plastic Footprint.